Google Talk is a Google service that is currently in beta (are not they all) which allows users to communicate in various ways with each other. It does feature PC to PC voice chat (with the option to record a voice message if the other user is not available right now) but also instant messaging and file transfers. Google Talk is not only used by individuals who want to chat with their family, friends and relatives but also by businesses who use it to communicate with customers and for internal support. One of the problems that users do experience is that there is not a way to let the user initiating the communication know that they are not available at that time. 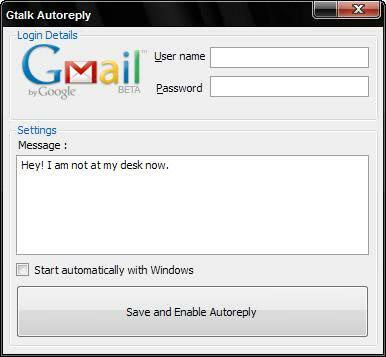 Enter Google Talk Autoreply; A lightweight Open-Source computer program that can be used to configure auto-replies that notify the Google Talk user that the person is currently not in the place to answer. The message that is automatically posted whenever the Google Talk Autoreply client is running can be configured individually. This message is then send to users who try to contact the user running Google Talk Autoreply. Security conscious users might want to analyze the source code as a Google account username and password have to be supplied. 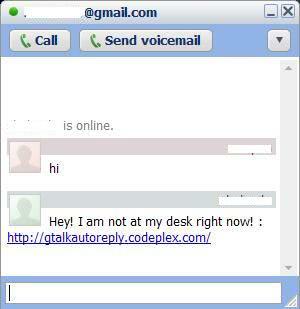 Google Talk Autoreply is available at the project's homepage at Codeplex. Gmail, Google Calendar, Google Docs, and Google Talk are all LEAVING beta soon! AD: Is not that date in the future? well, if you connect Gtalk (or any of protocols) through Pidgin, then you can add auto-reply function by plugin from “The Purple Plugin Pack “.